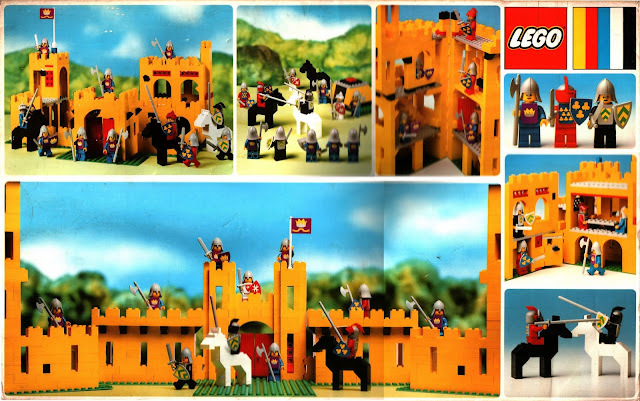 1978 was the year it all began for the world of LEGO Castle; this year released the first theme known simply as “Castle”. 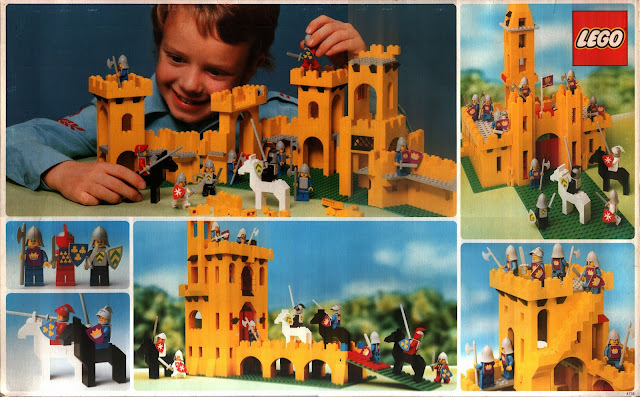 The theme went from 1978 to 1983, though no sets were actually released in 1982 (and only one was released in 1983), so the golden years of the initial Castle theme can be considered as 1978 to 1981. 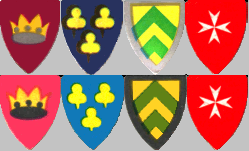 No actual clear factions where released during this time but if you examine each of the shields; it is possible to believe in six (or seven) separate factions (due to the different shield designs, (though there alliances and betrayals remain a relative mystery, solved only by the individual collector). 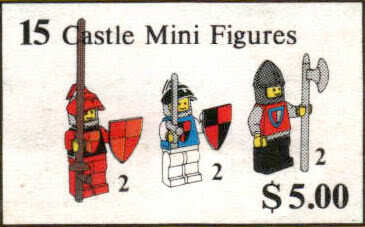 There was also a Classic Town set released during this period that included four Castle Minifigs (set no. 1592) which had this other emblem, note the similarities from this shield and the Crusaders one released a year later (the original is the one on the left). 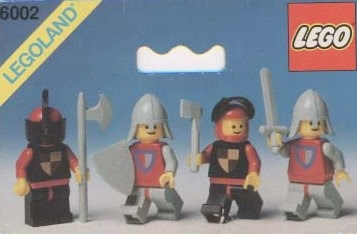 The theme introduced a number of new elements for the LEGO World, we see three helms (one of which is unique to this subtheme), brick built horses, swords, shields and two handed axes, strangely enough this theme saw no ranged weapons at all (perhaps people were fiercer back in the original sets days). Indeed it was an exciting time to be alive (I presume, as I was too young). So without further procrastination let’s look at the sets. This set was not actually available in the stores, rather it was a service pack that was available through contact directly with the company, and hence it is a rather unknown set. Still for a mere 5 dollars you receive six minifigs, another amazing attraction to this set is the fact that the helms on the left and in the middle are really rare now, whilst the helm on the right (still rare by today’s standards) was not actually available in sets until 1979 (the same goes for emblem on the shields and torsos as well). Image LEGO doing that now having a service pack with a unique mould, amazing. The first basic army building set (one of many in the future) this set was released in 1978, it’s a nice simple 3 figure set which was actually released fully assembled in a clear plastic box with a cardboard back, rather than the boxes we all know and love. As with the above set, the actual torso emblem’s where not available in other sets until a year later (clearly LEGO had the next years sets ready when they released this one). It should be noted that of the three helms that started the LEGO Castle theme, this one is still being used in sets of today (as are the axes, swords and lances from this era). 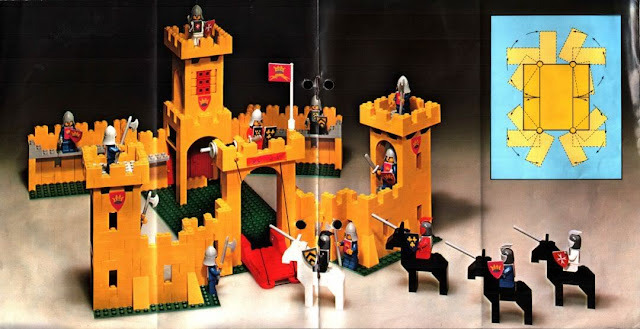 This army building set was released at the end of this themes life (1983) and was also the only Castle set released in that year; as such it was the very last chance for collectors to pick up the very rare helm. An interesting note is that this set also includes a blank shield (which was unique to this set) but due to the fact that many other sets in this theme included stickers for the shields this might just have been an example of LEGO being a little lazy (also the lack of weapon for the same fig as well). The black helmed man on the right is also carrying a small axe and is one of the only examples of a castle fig doing that (ever). 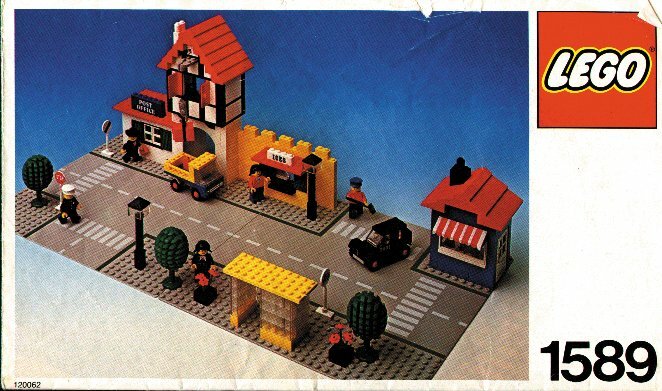 The first set non- army building set (hooray), released twice (possibly one date for Europe and one for America, correct me if I am wrong), and as we can see the set is rather nice. The minifigs in this set are printed and unique only to this set (excluding the service pack) and it is the first time that we see the closed variation of the helm, which was also only available for this theme in this set. The six figs in the set are very nice and there is an ample supply of weaponry, though personally I am not 100% convinced by the quality of the actual cart itself, the tires are woefully inaccurate and the supplies are just a random assortment of bricks. But still this is LEGO in its infant stage; they were learning at the time and as such can be forgiven for the flaws, the picture of all the extra stuff that can be built with the set is brilliant and shows that there was a degree of forethought within all their products. 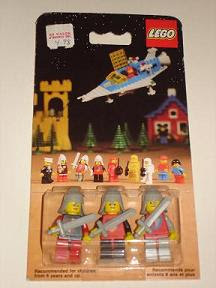 The Knights Tournament is my personal favourite set from this era, and that is due to one reason, the inclusion of the civilian figs, I remember when I was at school (at about the age of 10 or 12) my art teacher had this exact set glued upside down to the ceiling in his classroom (weird but true). 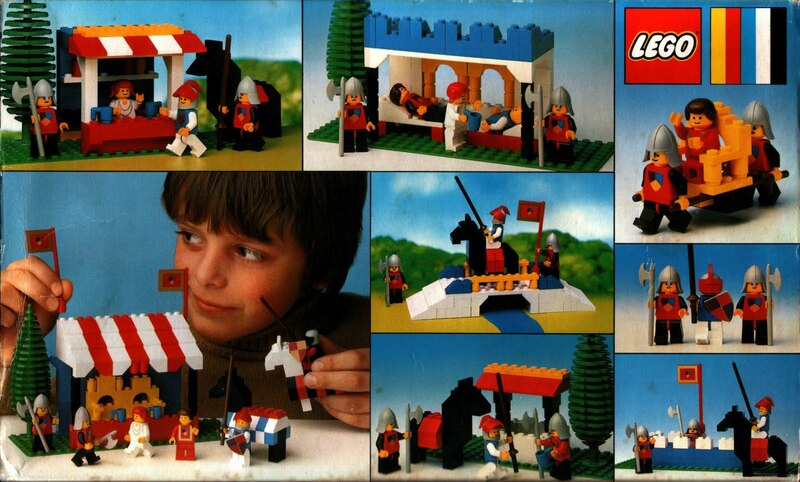 Even in these very early sets, you can see that LEGO had a clear view to include civilians alongside the knights (after all what’s the point in being a good knight if you have no one to defend). This set is very colourful but it works well, the red and white roof, fits perfectly with the blue wall and yellow seats, everything is combined well, and the attention to detail is fantastic, the blue cups for the spectators, the tree and the barding for the horse’s are all completely new to the castle theme at the time. It should be noted that the female’s hair is an extremely rare piece (and even rarer due to its colour) and all the figs are unique to this set (excluding the service pack again), put simply if you own this set you have some very nice collector’s items. Again the alternative models for the set show that there was a lot of versatility in these old sets, something sadly lacking in the modern ones. 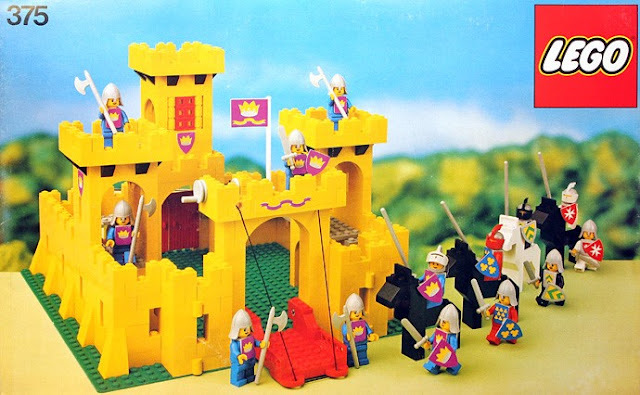 If I had one flaw with the set it would be the fact that the printing on the figs (and flag) do not fit with the Castle set, it would have been nice to have the same faction owning the Castle and the Tournament, still that is a minor flaw in something that was very original (at the time). This set was what started it all, over thirty years of love (that we have all experienced) came from the success of this product (take a moment, I know its special). Coming with a very generous number of bricks (767) and figs (14) this set might look basic, but it was actually very exciting for its time. 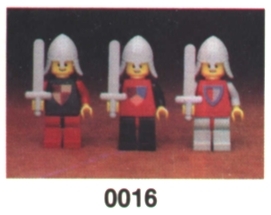 Every minifigs came with a breastplate (though a primitive early version) and we can see a total of four factions, the strongest of which contained eight men (five with axes, 2 with swords and shields, and one knight on a horse) whilst the other three contained only two each (a knight and a squire perhaps?). This set has great versatility, and the numbers of figs make it completely playable just on its own, it’s not clear if the six other figs are friends or foes but still it’s an interesting minifigs selection (image a set being released now this 6 minifigs as the adversaries). The set was also designed to be opened and the alternative models will have owners building for days, the castle itself features 3 towers, a front gate (which can be pulled up) and a back door (for a quick escape if the castle is overrun). The only flaws with the set are the brick built horse’s (I am not a fan) and the fact the castle is yellow, personally I have never been the biggest fan of the brick colour, as it’s just not that great (I once made it using white instead of yellow and it looked much better), but again due to that fact that this was the pioneering set, I can’t really complain, and the design itself is still very nice. Though not strictly a Castle set, I felt its inclusion was valid due to the brilliant little book shop (on the left) and the four castle minifigs, the yellow castle structure and the horse and cart. 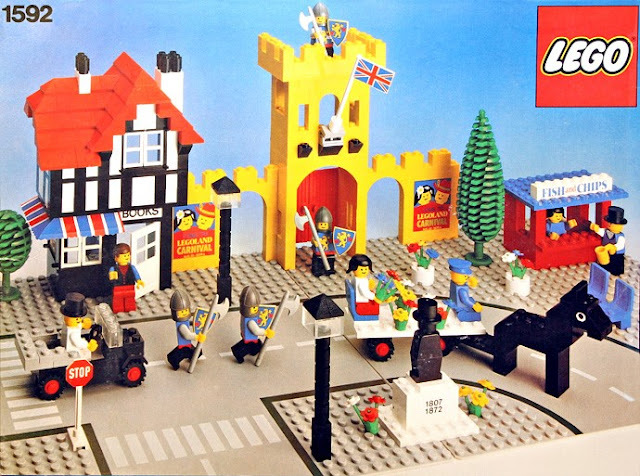 Image if you swapped the grey baseplates for green ones and removed all modern items (such as car, lampposts, top hats, bench and signs) then you would have brilliant early medieval village. Sadly I never had it, but I always wanted it. The same can be said for this set, though to a lesser degree. 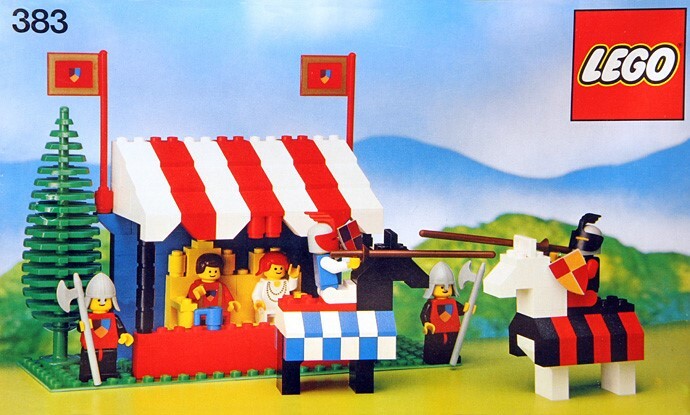 Sadly we have reached the end of my Classic Castle overview; overall the sets only really featured three designs (the Cart, Tournament tent and the Castle) so it is hard to judge the quality of the sets. Still the fact that they were popular enough to give LEGO a reason to produce the second wave of sets (Crusaders, Black Falcon’s and Forestmen) it can be judged favourably. Sure they had a lot more work to do, and from a modern perspective then the sets can be seen as very primitive, but that’s the way with everything (I’m sure in 20 years the sets we have now will seem privative to the sets of the 2030’s), so I will not complain. My one only real gripe with the sets is the fact that they had the potential to release great civilian houses for that era (take sets 1589-1 and 1592-1 for example) yet never chose to use them. I see this wave as an initial testing set, something LEGO tired to see if it would be successful and because we have Castle now I guess they were, something we can all be thankful of. I just brought this set down for my son. This was _the_ set of my childhood -- surpassing even the space ships -- I do not feel it is primitive at all; having to build each arrow slit makes it superior to the later grey castles, and I prefered these visored helmets that could be opened and closed (How many of you substituted a white, red or black base helmet to match the corresponding visor?) Even the brick built horses had advantages: a little rigging would turn them into bipedal dragon mounts! Thanks for this. 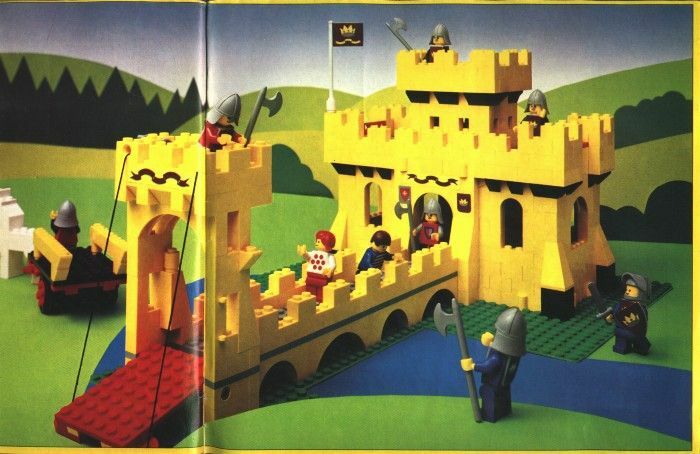 I agree that this set (I am assuming you’re talking about the castle) is one of the most supreme sets by LEGO, as it was so successful it contributed to the next 30 years of their product design (after this there was always a castle), and I too favoured my castle's over my space ships. Though I feel it’s a little dated by today’s standards that’s a natural course of things and not intended as an insult, the sets brick build design makes it very satisfactory to create (rather than placing a bunch of wall panels and then being finished). I’m still not sold on the brick build horses though (I have the same feelings towards the new hens and chickens, I like them much more than the brick built ones from MMV). I believe the top hats in 1592 were very rare until Lego decided to revive them in the 90's. Have never seen these pictures of the early castle mini-figs before this blog. Tyvm! Would love to get my hands on those old school striped shields! what's your favorite/most desired set? Sorry, but the white and red roof mixed in with the blue and yellow looks absolutely ridiculous. Anyone who says otherwise is just wrong. There is but one word for that color combination: tacky. Love your castle blog. I too, owned a yellow castle. It was my first and (until now) last Lego experience. I think was 5 or 6 at the time and had a most frustrating experience trying to put it together. My dad (a builder) helped me but he couldn't understand why I couldn't follow the instruction manual. Now my son is a lego enthusiast at age 3, so I recently converted to a lego fan. I wanted to track down my original yellow castle but it looks different to how I remember it. For example, I feel sure the drawbridge was black, and I think all my knight's had dragon shields. Are 375 and 6075 the only yellow castle sets? Were there any other variations that you know of? one of the sheilds you forgot is the one that has 3 colors on it.